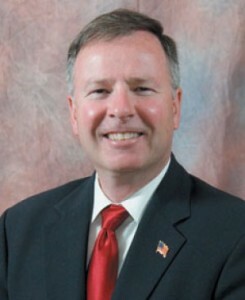 Rep. Doug Lamborn (R-Colorado Springs). …Lamborn, 64, told the Natural Resources Committee he can understand how some of his younger colleagues have bought into the idea. Ouch, grandpa! Of course, there are plenty of “grownups” well over the age of 25 who argue a swift and determined migration to renewable energy is an urgent priority–and if Lamborn speaks for the rest of the Republican Party in declaring 25-year-old Americans are not “adults and grownups,” well, that’s a big problem for Republicans in…every future election? It’s tough to imagine the 18-25 bloc of voters ever taking that kindly. It’s not really a surprise to see Rep. Lamborn put off by bold initiatives from the new Democratic majority in the House, with basically no legislative accomplishments of his own to celebrate after over a decade in Congress. When Lamborn does make the press, it’s usually for embarrassing self-injury like referring to President Barack Obama as a “tar baby.” In the Colorado legislature, Lamborn was best known for his quest to swap the names of Colorado’s Mount Democrat and Republican Mountain so that Republicans would have the taller mountain (this is not a joke). So no, like that special baby boomer in your life who talks about “kids today” with a disapproving sneer, it’s a safe bet that Rep. Lamborn is never going to be a supporter of the Green New Deal. It may unfortunately be necessary for another election to pass before anything like this plan has a realistic chance of becoming law, serving until then as a point of contrast between the two parties for voters. And though his own seat may be safe, Lamborn is a good contrast for voters everywhere too. Look for more old people to mention "Soviet style" as an attack on anything that Dimocrats propose. But, here is the problem. Anyone under the age of 45 has no clue about the Soviet Union. The oldest were 15 when it collapsed. We will also see “Socialism=Venezuela” right up to November 2020. But, again, not really going to work. 82% of “Americans” could not find VZ on a globe if you spotted them Columbia and Brazil. 87% of “Americans” don’t care about anything outside the USA. This was at Lamborn’s town hall in 2017. Young Haven invites Lamborn to come to her science fair to learn about climate change. At least he didn't turn to her and say, "You, you shut up!" like he did to his Democratic opponent (known on Pols as "BarronX") back in his 2006 race for CD 5. And he didn't pull a Vickie "Ray Walston" Mable Boy Scout stunt. BarronX ran under the Constitution Party banner, if I recall. By golly, you're right. He was a write-in candidate as a Democrat in 2006. Pulled in a whopping 12 votes! Not sure how they determined party on the write-in. His Republican write-in rival got 41 votes. Lamborn was born at the age of 40. He was an old fart from the start of his life. Odd that Lamborn would lambast Soviet-style policies when he supports the currently occupants of the Executive Branch, a bundle of corruption and self-service you could only pluck from the USSR itself. Old enough to remember when "Soviet style" meant something!